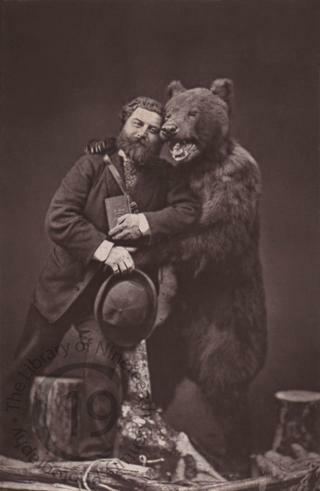 A portrait of Henry Auxcouteaux de Conty (1828-1896), publisher of Conty's Practical Guidebooks (Guides Practiques Conty), seen here with a large stuffed bear. Issued as an advertising promotion, the mount carries printed captions publicising Conty's guidebooks. Further text verso mentions the Bear Pit in Bern (Switzerland) and gives the date, 15 January 1877, but doesn't explain the connection between the bear pit and the bear seen here, nor the significance of the date, though it's clear that Conty had bought the bear and that it could be seen at his premises in Courbevoie. Photographed by Adolphe Braun of Dornach and Paris.